Baked salmon is a beautiful thing and this herb crusted salmon is served with a vibrant green warm lentil salad and a simple but great balsamic dressing. I typically grill or fry salmon because it is quick and simple but I love a bit of baked salmon too. This verdant green number is inspired by the changing content of our supermarket shelves. It may only be the end of February but the green stuff is returning and I will be shortly planting crops. This recipe is glorious, peppery from the rocket which compliments the almost peppery flavour of puy lentils. We then have a little sweet and sour flavour from the peas and balsamic to sit alongside the rich baked salmon. Baking salmon is the perfect way of cooking salmon for those that like it cooked opaque all the way through. This is because the heat is a little less intense and direct than it is from a pan. Most of my salmon recipes here are like my quick Korean salmon or teriyaki salmon. They are cooked so that the flesh is still very pink inside. You can cook your salmon through more completely in a pan but you need to be careful. But for me, the best way to do this is in the oven as it helps avoid salmon that is wooly and overcooked. Lentils As A Side Dish. I love using lentils as a side dish like this, they have such a great flavour and texture, they are also really nutritious. I use them all of the time and they are just as good with meat as they are with fish. You should check out this lightning-quick bacon wrapped pork tenderloin with cabbage recipe. 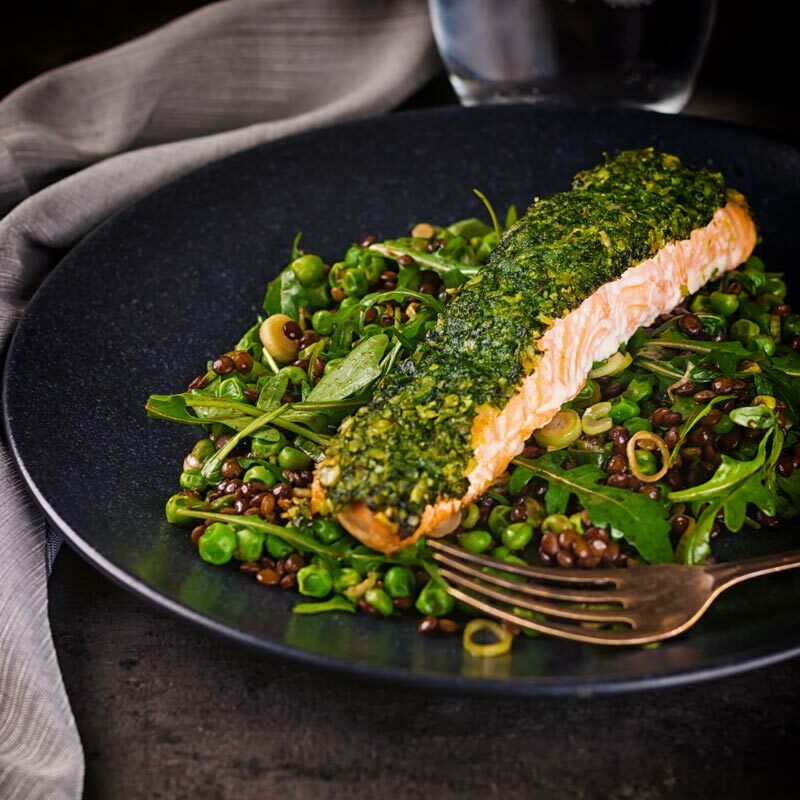 It shares the same ‘ethos’ as this herb crusted salmon recipe but with a different flavour profile. This baked salmon recipe features a herb crust. A Technique that I often see more closely associated with lamb. It is one that works fantastically with the richness of the salmon. This particular herb crust features parsley and basil and is held together with hazelnuts. The flavours work really well together, you could change it up though and play with other ideas. For instance, coriander and parsley would work wonderfully with peanuts for an Asian influence. Fingers crossed for more colour over the coming weeks and a little less brown! Place the 15g of parsley and 20g of rocket in a blender with one tablespoon of olive oil and half a teaspoon of salt and blend to a paste. Add in the hazelnuts and pulse you do not want to take this all the way down to a smooth paste. Sandwich between two pieces of baking parchment and roll out so that it is big enough to cover the top of both slices of salmon and chill for 20 minutes. Place a pan of water on the stove and add the lentils, bay leaf and a quarter of a teaspoon of salt and bring to a boil. When boiling reduce the heat to low and allow to simmer for 25-30 minutes. Heat your oven to 180°C or 350°F. 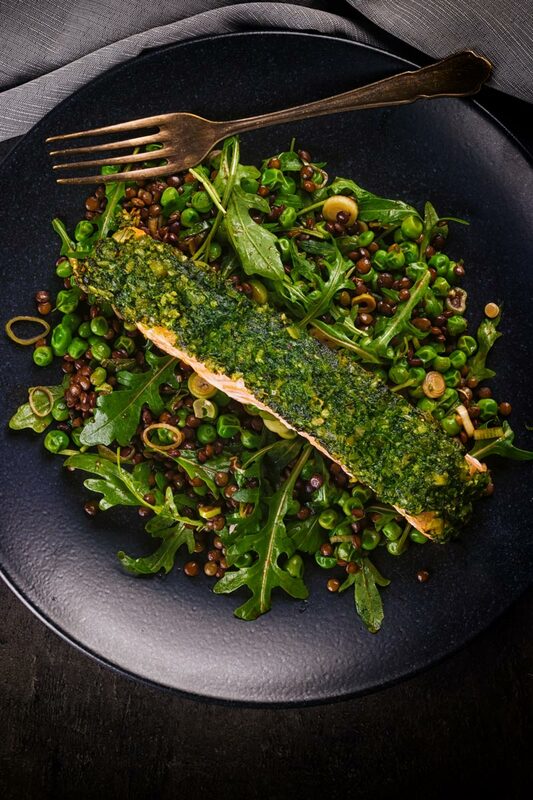 Top your salmon with the crust and then place in the oven and cook for 15 minutes (timed to finish cooking 30 minutes after the lentils go to simmer). 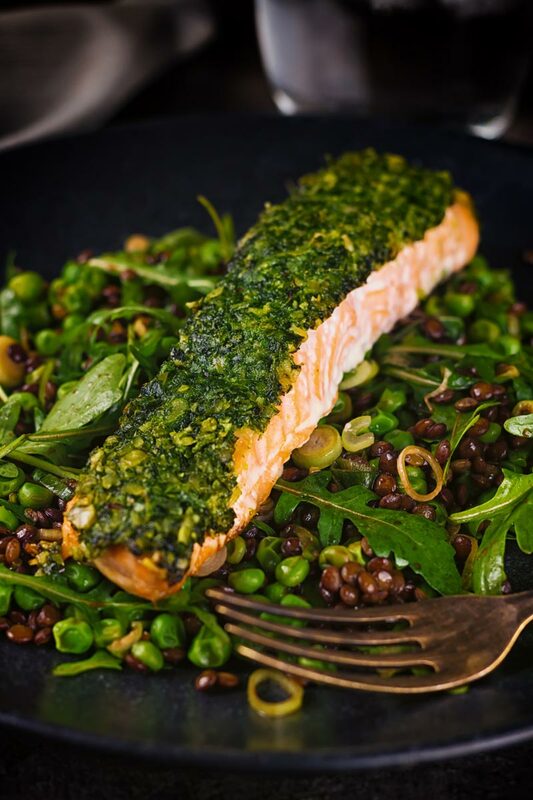 Meanwhile cook your peas for a couple of minutes so that they are still hot when your lentils and salmon is cooked. Mix together together the balsamic vinegar with a tablespoon of olive oil, mustard and a quarter of a teaspoon of salt to form a dressing. Add the peas, lentils, spring onions to the dressing and toss to coat. Mix in the rocket leaves to the lentils then place on the base of the plate. I love the flavors you went with, especially the choice to use hazelnuts! Sounds so fresh and earthy. Very excited for spring here too. I love that you crusted the salmon with herbs and hazelnuts. Those flavors work quite nicely with the fish. We fortunately have access to good salmon. Rocket on the other hand, is a bit harder to come by. I look forward to giving this a try. Thanks Leslie, the flavours work wonderfully together, enjoy! 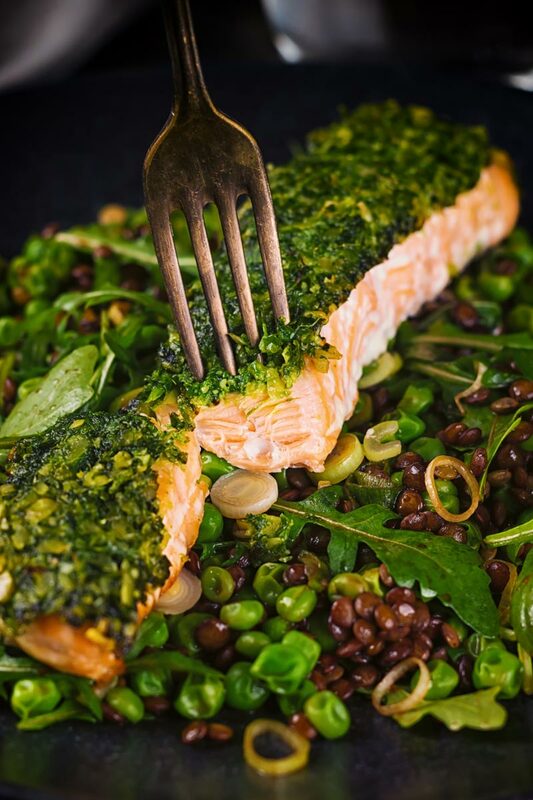 This looks delicious – I’m loving that thick, richly green herb crust! 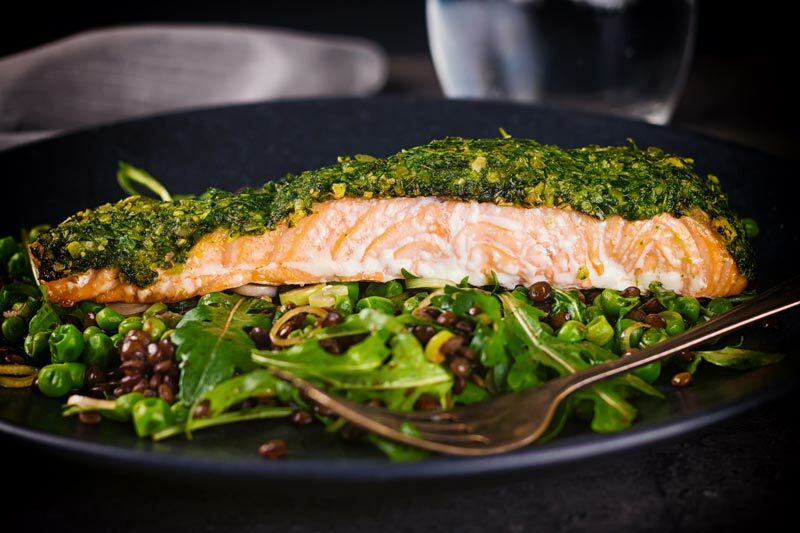 It’s sad that you can’t find high-quality salmon very often – it’s one of my favorite healthy, straightforward meals. Glad you found a piece to allow you to share this lovely recipe with us! Thanks Monica… It is a little sad, we do make up for it with access to glorious and affordable game, but I do miss fish! Love salmon, we are lucky in the UK as quality salmon is readily available. I am trying to cut down on carbs a little at the moment and this is such a perfect recipe for me. Love your photos. Thanks Nicky, I’m British by birth and really miss the fish and seafood I was bought up with. The joys of a small island I guess 🙂 This recipe is glorious and the lentil salad would match up wonderfully with so many foods.